Historic signage is a way of recognizing important historic sites, particularly those that no longer exist. These signs are used to inform visitors and the community about why a site is historic and significant. Maintaining a historic environment contributes to people’s sense of place, and helps us link to our roots and maintain a sense of cultural identity. 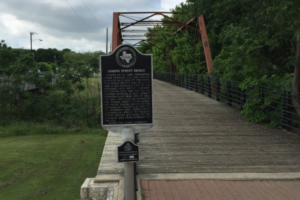 The City of Waxahachie has many historic signs that represent our history and culture. If you have a suggestion for a historic sign, please send an email to historicwaxahachieinc@gmail.com.